• He says U.S. fate "worse than anything you have yet seen"
In a January 11 speech about changes in Iraq policy, President Bush said he will increase American forces by more than 20,000, the vast majority of them coming from "five brigades [that] will be deployed to Baghdad." Bush said he would send an additional 4,000 troops to Anbar province, where, he said, "local tribal leaders have begun to show their willingness to take on al Qaeda." FBI reports plans of attack on U.S.
FBI officials said Monday that U.S. forces found documents at least six months ago indicating al Qaeda in Iraq was planning an attack on U.S. soil. Officials who have seen the documents said the plot was more "aspirational" than "operational." The FBI said it has no indication of a specific threat at this time. Intelligence officials said the documents suggested using student visas as a way to get potential terrorists into the country. At least two of the September 11, 2001, attackers used them to get into the United States. At least two other September 11 attackers received student visas after entering the country on nonimmigrant visitor visas. Officials said there was no target mentioned and no specific details on what kind of attack would be staged. Still, officials said the documents prove al Qaeda in Iraq wants to attack inside the United States. One senior intelligence official said that the progression of the plot was "so early" the group was "years away from pulling it off." The "intent was there, but the execution was not even close," the official said. When the documents were found, the FBI sent an advisory to its state and local partners about student visas. In al-Zawahiri video he rejected Bush's contention that U.S. forces have deprived al Qaeda of safe haven in Afghanistan, calling the claim a "naked, barefaced lie." In remarks intended for the American people, he said, "If you want to live in security, you must accept the facts of what is happening on the ground, and reject the fantasies with which Bush tries to deceive you. "You must honestly try to reach a mutual understanding with the Muslims, for then and only then you might enjoy security. If, however, you continue with the policy of Bush and his gang, you will never even dream of peace." He further warned, "What awaits you should you press on is much worse than anything you have yet seen." Last month, the FBI warned that the death of the ailing sheikh with strong ties to al Qaeda -- serving life in prison for his role in the 1993 World Trade Center attack -- could lead to terrorist attacks against the United States. His imprisonment has served as a rallying point for the terrorist group and their sympathizers. Abdel-Rahmen had a small tear in his esophagus and was treated with a "needed transfusion to replace lost blood," said an FBI bulletin that surfaced in December. Medical personnel then discovered the cleric had a tumor on his liver, the FBI said. He has been imprisoned since 1995 for inspiring the 1993 World Trade Center attack and a thwarted plot to attack bridges and tunnels, an FBI building, and the United Nations headquarters in New York. Last month, al-Zawahiri -- who is also Egyptian -- released an audiotape and another video in which he said al Qaeda will retaliate against the United States for its military actions in Muslim lands. Titled "The Correct Equation," Monday's video is subtitled in English and features al-Zawahiri dressed in a dark robe and white turban against a dark background. 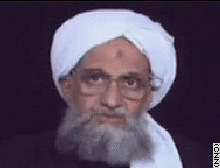 Ayman al-Zawahiri, al Qaeda's second in command, as he appears in the video released Monday.